"This is a fantastic recipe which will quench your thirst. 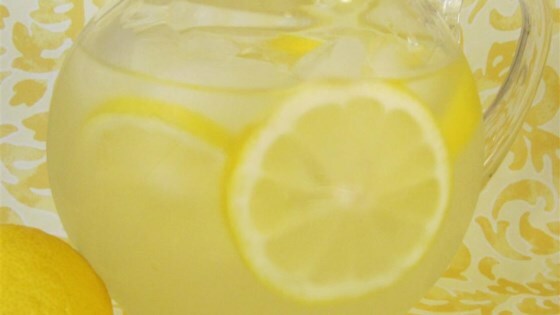 Once you try it, you will agree that this lemonade is better than lemonade you drink in a restaurant." In a saucepan, combine 3/4 cup water and 2/3 cup sugar. Bring to a boil and stir until sugar is dissolved. Set aside to cool. This step can be made in advance and stored in the refrigerator. In a pitcher, combine syrup, lemon juice and ice water; stir. Adjust to taste. Pour into a tall glass with ice. At first we thought it was too much sugar. But then we tried it and then it was fantastic. It was the perfect combination of water, sugar, and Lemons. I put just 1/3 cup sugar and it was awesome!!! Thank you for the great recipe!